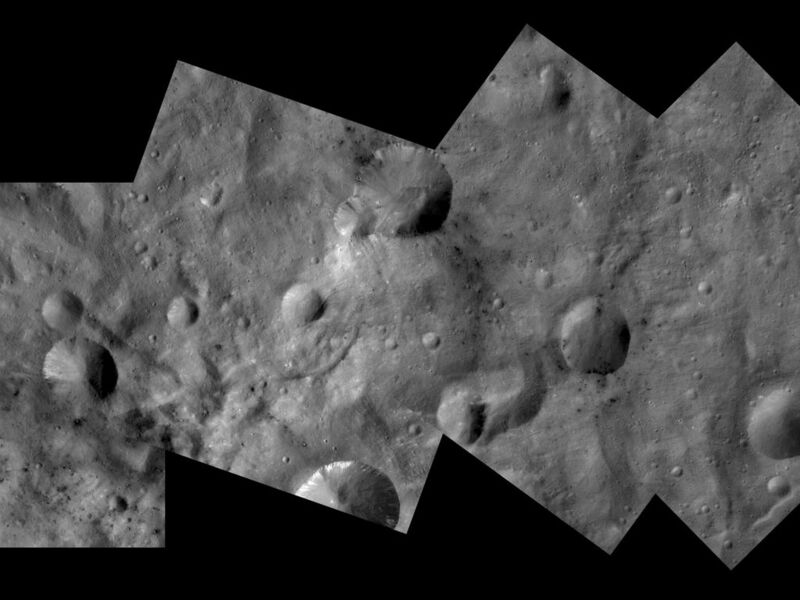 This Dawn FC (framing camera) mosaic shows craters with both sharp and smooth rims, a 'ghost' crater and dark and bright material in Vesta's southern hemisphere. The craters with both sharp and smooth rims, shown in PIA14960, are in the far left of this mosaic. The 'ghost' crater is located in the bottom left corner of the second square in the mosaic. It is visible as a shallow, roughly circular depression which is infilled with material of different albedos (e.g. brightness). This infilling material is probably Vesta's regolith, which is a layer of loose material/debris. This ghost crater must be reasonably old to be so comprehensively filled with regolith. It has also been cratered by many small impacts. There is quite a lot of dark and bright material distributed throughout this mosaic, some of which is associated with the craters and some of which does not appear to be associated with craters visible at this resolution. 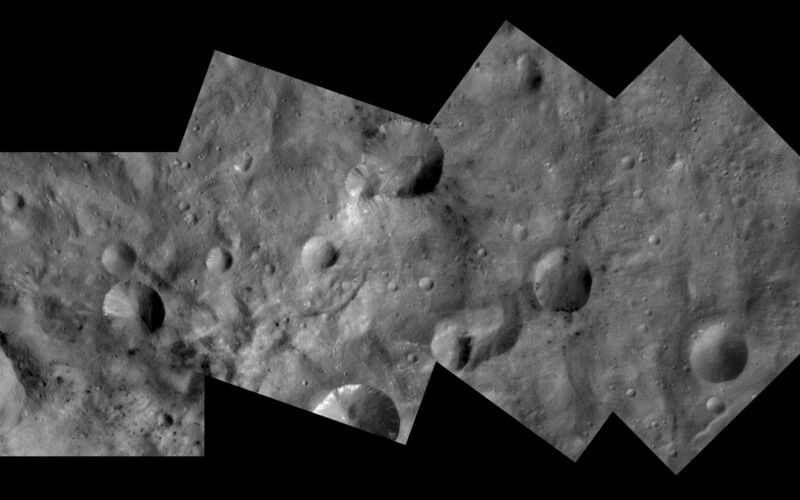 NASA's Dawn spacecraft obtained the images that form this mosaic with its framing camera on September 30th 2011. These images were taken through the camera's clear filter. The distance to the surface of Vesta is 702km and the images each have a resolution of about 63 meters per pixel. The Dawn mission to Vesta and Ceres is managed by NASA's Jet Propulsion Laboratory, a division of the California Institute of Technology in Pasadena, for NASA's Science Mission Directorate, Washington D.C.. UCLA is responsible for overall Dawn mission science. The Dawn framing cameras have been developed and built under the leadership of the Max Planck Institute for Solar System Research, Katlenburg-Lindau, Germany, with significant contributions by DLR German Aerospace Center, Institute of Planetary Research, Berlin, and in coordination with the Institute of Computer and Communication Network Engineering, Braunschweig. The Framing Camera project is funded by the Max Planck Society, DLR, and NASA/JPL.